I had the opportunity to meet Head Sushi Chef Hiro Sawatari during my dinner at the restaurant. Watching him in action is like poetry in motion, as he is a true culinary artist deftly combining traditional skills with contemporary presentations. Learning the art of sushi is an in-depth process with long apprenticeships, and Chef Hiro Sawatari has thirty-five years experience and has a loyal following that come to Sen NYC to experience his skill. Growing up in Kyushu, Japan, he discovered the art of sushi at a young age and honed his culinary skills working at top restaurants. 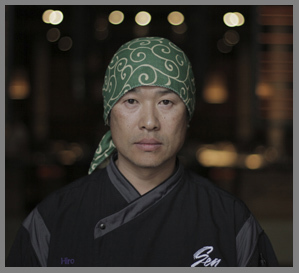 Chef Hiro immigrated to the Unites States in 1984, and his career has flourished. During my dinner at Sen NYC, one of the many courses I sampled was Chef Hiro Sawatari's presentation of Tuna Tartare, which was visually impressive, and a delectable palate sensation with lovely contrasts, sweet and savory, citrus and bitter greens, and smooth and crunchy textures. Chef Hiro Sawatari graciously shares his recipe for Tuna Tartare. Soy Cured Quail Egg, just yoke, no white. Cure for at least 1 hour. Method: Chop the tuna with a pinch of scallions and shiso until minced. Presentation: Put the tuna in a small metal ring in center of plate. Make a dimple on top of the tuna for quail egg. Remove metal ring and place marinated egg on top. 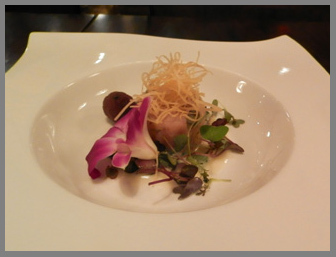 Pour 2.5 ounces of dressing around the tartare and garnish with black sesame, wontons, and micro greens. Place mountain peach on side under spoon. Method to Eat: Mix all ingredients together with a spoon and enjoy. Finish with the pickled peach as a palate cleanser. Itadakimasu, (pronounced Ee Tah Dah Kee Mass), which means Bon Appétit in Japanese. Sen NYC serves Lunch Monday through Friday from 11:30 am until 2:30 pm, Happy Hour Monday through Friday from 5:30 pm until 7:30 pm, Dinner Monday through Thursday from 5:30 pm until 10:30 pm, and on Friday and Saturday from 5:30 pm until 11:00 pm. The Bar and Lounge are both open later. The restaurant is closed on Sunday. Read about Sen NYC in the Restaurants section. 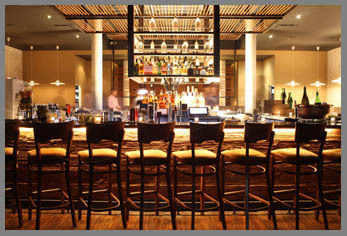 If you plan to be in Sag Harbor, be sure to visit Sen NYC's sister restaurant, Sen Sag Harbor. The restaurant opens at 5:30 pm with seating until 9:30 pm Sunday through Thursday, and seating until 10:30 pm on Friday and Saturday. There is a Tasting Menu with seven courses for $28 available Sunday through Thursday. Follow Sen Restaurants on Facebook at www.Facebook.com/SenNewYorkCity or www.Facebook.com/SenSagHarbor. © July 2013. Luxury Experience. www.LuxuryExperience.com All rights reserved.